WordPress updates come and go on our websites and we often don’t have a chance to learn about some of the new features that are introduced with an update. One of those updates is a very helpful approach to editing links on your site which allows you to easily link to other pages or posts on your site. 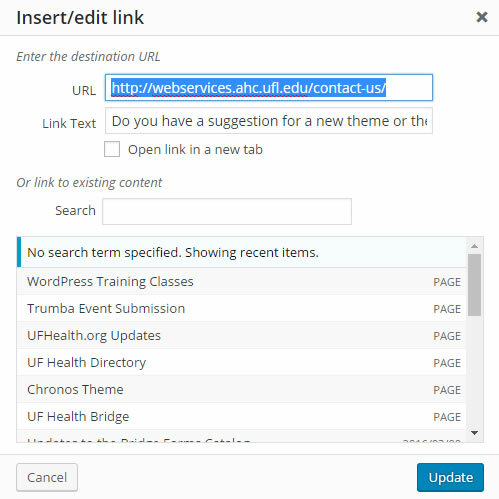 If you have any questions about the Link Options tool, or WordPress in general, please don’t hesitate to contact Web Services at webservices@ahc.ufl.edu. Open a post or a page you would like to edit, and then highlight an existing link, and you will see a small box appear just below the area you highlighted. If you are creating a link, highlight the text you want to create the link with and click on the chain link icon in the toolbar. You can also click on the chain link icon without highlighting text when creating a new link. Clicking on the pencil icon allows you to quickly edit the URL if you need to make a quick update. Once you’ve edited the URL, click on the blue button to Apply this new URL to your link. Now you’re done! However, if you need to link to another page or post, click on the small gear icon to open Link Options. Below you can see an example of the Link Options window. In this window, you can edit the URL and the text of the link, search for the page or post you need. Then click on the page/post you want to link to and click Update.